First of all, let me say a few words about my gear and base weight philosophy. 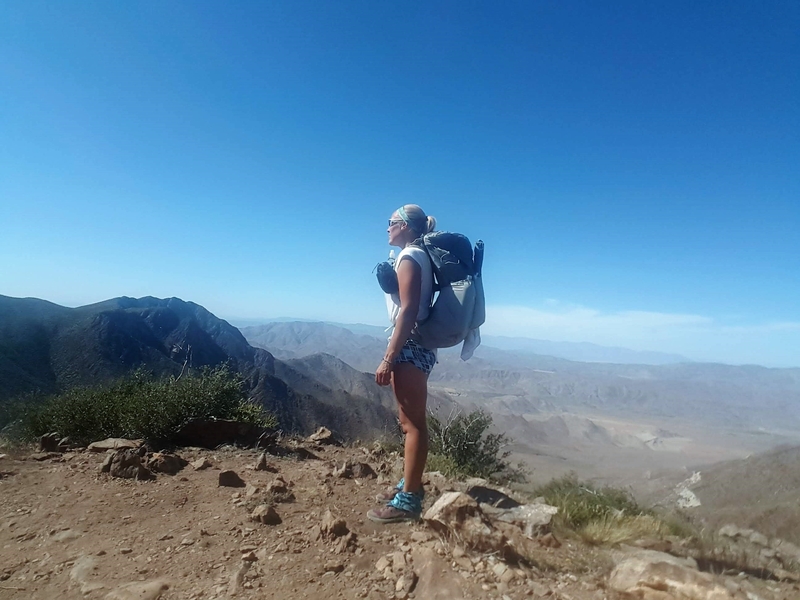 I enjoy a light pack; it allows me to mix hiking with jogging, and it’s so much more pleasant to carry for days on end. However, I want to be able to keep hiking under all expected conditions, and not have to bunker down and wait for a storm to pass. I want to know I can navigate even if my phone dies, and to be able to repair the most anticipated gear failures. Also, I want to be sure I can provide myself or a fellow hiker with first aid on trail. I am willing to pay the weight penalty for these things. There are many great light backpacks on the market. I love Osprey’s Airscape system, which makes the pack come out from your back a little, creating great ventilation. I can’t see myself having a pack that sits directly on my back again, and that’s the main reason I’ve chosen the Osprey Lumina 45. It’s the lightest pack with this ventilation system, and I find it extremely comfortable. I’m not loving the side pockets but I can live with them. I’ve added a water bottle holder and a pouch to the shoulder straps, to allow for drinking, snacking, and accessing my phone on-the-go. With the extra pouches and a rain cover, this pack weighs in at 32.1 ounces. So I should say I’m the kind of hiker who pitches her tent every night I can. Having all my gear (minus food) in my tent helps me keep my things in order. I feel safe there; if there’s a bear 10 feet away but I can’t see it, I don’t have to worry. Right? It keeps bugs, spiders, snakes, and other creatures I don’t want in my face or in my sleeping bag out. OK, maybe I’m a chicken, but the point is I like my tent and I sleep in it a lot. The Nemo Hornet 2p is a palace. I’ve slept in tents this size with a few of my exes. 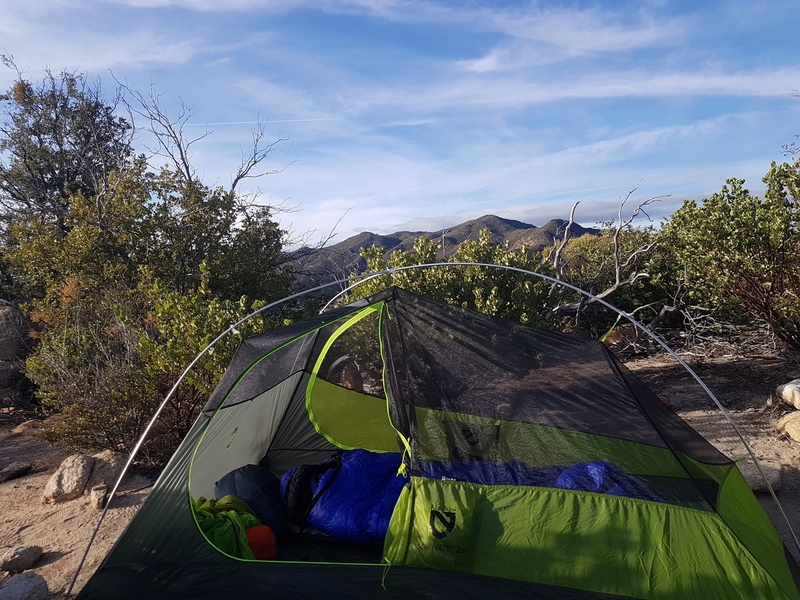 Admittedly, we’re not together anymore, so it could be a bad idea, but it is doable to share this tent with a hiking partner. I’m keeping this one all to myself; I’m the queen of this castle. This tent has three optional guyout points, and you want to be able use them all so bring those extra guylines. I’m very impressed with how well this tent, properly pitched, handles strong winds. Completely staked out it requires nine tent stakes; here one can choose to use rocks at least for the extra guyout points. I just carry the nine stakes, which makes the complete tent weigh 34 ounces. One can definitely question the need for a groundsheet. I’ve chosen to carry a Tyvek one that I’ve trimmed to fit (be slightly smaller than) the size of my tent floor. It does protect the tent floor, and improves its waterproofness. But ultralight tents doesn’t last forever anyway, and if you’re fine with patching up some holes in your tent floor, one can certainly do without a groundsheet. 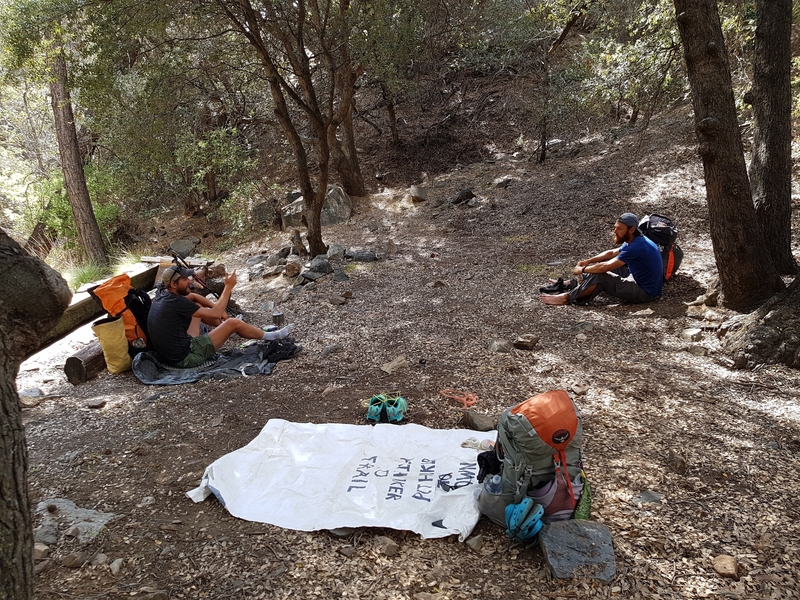 Since I have an inflatable sleeping pad, the groundsheet doubles as a sitting mat during breaks, and that makes it worth carrying to me. My groundsheet weighs four ounces. You guys who sleep comfortably on a foam pad, I envy you. I’ve tried and tried but I always end up waking up every so often from pressure points hurting. At this point, I’ve resigned to the fact that I need an inflatable sleeping pad to get my beauty sleep in. I’ve used the NeoAir XTherm for years, but for this hike I’m trying the XLite W for the first time. It has an R-value of 3.9, compared to XTherm’s 5.7, but it also weighs 10.8 ounces instead of 15.1 ounces, and its length is better suited for me. So I’m giving this one a try. Western Mountaineering makes the best sleeping bags I’ve ever tried. While quilts are lighter than mummy bags, in my experience a down collar and hood prevent cold air from getting in at the neck area every time you move, thus making the bag so much warmer. It’s a matter of personal choice, but I’m not ready to let go of the mummy bag. This bag has been my go-to three-season bag for years and it’s coming with me on the CDT as well. The Ultralight is a 20-degree bag. I’m a very cold sleeper and find this bag warm enough down to about freezing temperatures. I combine it with a down sleeping bag liner (I will come back to this in the snow-gear blog post) for the colder sections. My WM Ultralite weighs 27.4 ounces when packed in a dry bag. Call me princess, sleeping beauty, or any name in the book. At 1.7 ounces, the Sea to Summit Aeros UL pillow makes a huge difference in sleep comfort. 10/10 would recommend. There you have it; my big three. Total weight, 6.9 pounds. Hit me with your thoughts.